Few Americans have a taste for mutton. Some farmers and chefs are trying to change this, but it turns out mutton is more ubiquitous than you might think. Though sheep of all ages are widely consumed around the globe, few Americans even have a taste for lamb, which constitutes the bulk of domestic sheep meat production. In fact, the average American eats less than a pound of lamb annually, though disproportionately more in the East Coast’s ethnic enclaves. Recent African, Hispanic and Middle Eastern immigrants are generating new demand for fresh lamb and even mutton — staple meats in their cultures ”“ giving the beleaguered but fighting sheep industry some help. Others are attempting to give mutton a boost through education and marketing. Yet perhaps mutton is already more ubiquitous than we realize. After all, mutton is a natural by-product of the country’s lamb and fledgling dairy sheep industry. To actually profit, the 82,000-plus farmers of the U.S.’s 5.3 million sheep can’t afford to keep unproductive ewes with sub-par genetics — those who don’t conceive, birth, mother or lactate properly — alive. Rams after three or four years of breeding are also slaughtered. So where has all this mutton gone? We’ve long exported live ewes through San Angelo, Texas (the country’s largest sheep and lamb auction) to Mexico for barbacoa de borrego. For each of the past five years, the also large New Holland, Pennsylvania auction has sold at least 30,000 live sheep to New Jersey’s halal abattoirs, to supply ethnic grocers and restaurants. Direct farm-to-customer sales (think a custom-butchered whole or half lamb) are growing — the way about one-third of all lamb bought in the U.S. is now sold. And a lot of adult sheep widely go into “lamb and rice” dog and cat food and even jars of baby food, says USDA’s Rebecca Sauder, who oversees the San Angelo auction. Food processors don’t necessarily distinguish between lamb and mutton — “it’s basically marketing,” says Sauder. Sausage is mutton’s perfect vehicle, since spices, garlic and curing salt disguise any unfamiliar flavors. In fact, we may also have eaten mutton in products like “lamb” sausage. Sausage is mutton’s perfect vehicle, since spices, garlic and curing salt disguise any unfamiliar flavors. 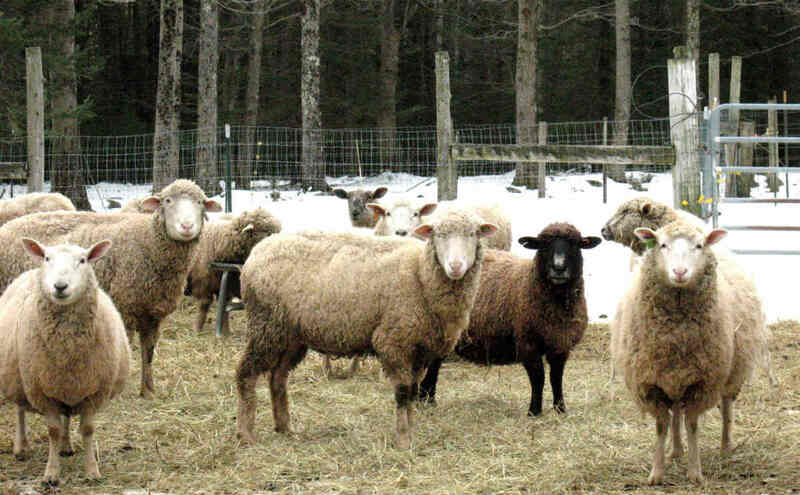 Master shepherd Tom Settlemire, who breeds Maine’s native Katahdin hair sheep known for their mild meat, says his culled ewes at Crystal Spring Farm go into a sausage along with the meat of underweight lambs. The tasty sausage, which cuts like a Brat, is stuffed into lamb-casing for a product the butcher labels “natural lamb.” Settlemire, who grew up on sheep farm in post-War Ohio, admits this is the only way he finds the stronger-flavored mutton palatable. Settlemire is not alone. Even New York City’s Keens Steakhouse, where “surprisingly mellow mutton” chops were one of the restaurant’s claims to fame since its establishment in 1885, long ago replaced mutton with lamb saddle. One of the few restaurants still nationally known for mutton is Moonlite in the Welsh-settled Owensboro, Kentucky. They buy more Midwest-sourced mutton than anyone, or about 10,000 pounds a week. The fat-capped meat, from two-year-old ewes who’ve lambed once, is hickory-smoked overnight into barbeque and burgoo (mutton stew). Given tight supplies and an uptick in lamb demand, owner Pat Bosley says it’s getting harder to buy domestic mutton, which further fell out of favor when the grill made Americans forget how to cook cheaper cuts, low and slow. Despite its stigma, the U.S. now imports mutton from Australia and New Zealand — a whopping 19.5 million pounds through August 2013, up 37 percent from the previous year. Why? America’s changing demographics. Despite its stigma, the U.S. now imports mutton from Australia and New Zealand — a whopping 19.5 million pounds through August 2013, up 37 percent from the previous year. Why? America’s changing demographics. Eyeing this trend, extension agents in Maine, Maryland and Ohio just organized a four-part webinar on marketing lamb (and mutton!) to new ethnic consumers. Even groups that prefer lamb are willing to buy older sheep for the right price, says Katherine Harrison, a sheep farmer and butcher from near Columbus, Ohio, who presented the second webinar. It’s also worth noting that the spring lamb so in demand come Easter and Passover could be 10 to 11 months old, or almost mutton, unless quickly grain-fattened on a Colorado feedlot or of the very young hothouse variety. A farm lamb commonly born in February or March would be too scrawny to eat. In fact, Apple Creek Farm’s Galle says that lamb is often slaughtered right on the mutton line. On the kill floor, Harrison says butchers look for whether the carcass still has baby teeth and cartilaginous “break” joints that haven’t yet ossified into mutton’s telltale fused shank joints. Thus, an immature 14-month-old still gets labeled lamb. In the UK and Down Under, young mutton from under a two-year-old sheep is actually known as hogget, more coveted than older sources. We could take a cue from the “Agneau et Mouton” section of Julia Child’s Mastering of the Art of French Cooking. “Mutton, though much appreciated in Europe for its developed flavor, is not popular in America and generally must be specifically ordered,” Child noted in her 1961 tome. Still, she encourages substituting mutton in any of her lamb recipes. So ask your lamb farmer about a bargain on hogget or mutton and substitute away. Think Shepherd’s Pie or curries, dishes with strong marinades and aggressive spices to smooth any overly-gamey flavors. Dress up mutton as lamb this holiday season and see if friends can tell the difference — if they even know what mutton is. Courtesy of Matt Bennett, the James Beard Award-nominated chef-owner of Sybaris Bistro in Albany, Oregon, who has long sourced his lamb (and mutton) from nearby Rain Sheep Lamb there in the mid-Willamette Valley. Bennett says the tagine was very well-received by diners, “many of whom thought they hated mutton.” But he notes that sourcing mutton can be difficult. Most suppliers “don’t want to mess with it,” though sheep farmers will butcher if convinced they won’t get “stuck” with unsold cuts. 1. Combine mutton chunks and all spices and chill overnight to firm the meat and to thoroughly season. 2. The next day, heat large Dutch oven over high heat. Add oil and heat until oil shimmers. Add onions and garlic and fry until deeply browned (about 10 minutes). 3. Add meat and keep stirring over high heat until meat begins to brown. 4. Add carrots, turnips and dried fruit. Cook and stir another 2 minutes. Add stock and bring to a boil. 5. Reduce heat to simmer and cover. Cook until the meat is very tender (about 2 hours). 6. Season to taste with salt, pepper and sugar to get the balance you enjoy. Serve on couscous, mashed potatoes or rice. Serves 4-6 and reheats marvelously.